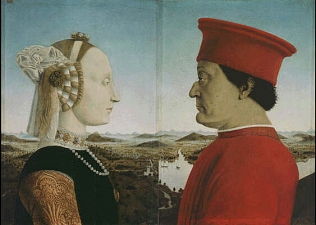 The two panels representing the Portraits of the Duke and Duchess of Urbino were painted by Piero della Francesca and they date back to c. 1467-1470. Piero della Francesca was one of the most significant painters of the 15th century. We can perceive here something new, if compared to the paintings displayed in the previous rooms of the Uffizi Gallery: a private subject, a noble, refined couple is represented. Here Piero della Francesca reveals his ability in painting tiny little details composing the landscape which is behind the two figures and also his extraordinary skill in the use of perspective.